Italian American Girl: TLC Premieres New Show, "CAKE BOSS" With Italian American Master Baker, Buddy Valastro. TLC Premieres New Show, "CAKE BOSS" With Italian American Master Baker, Buddy Valastro. Get ready this summer, you can watch an extraordinary new series on TLC called, "CAKE BOSS." 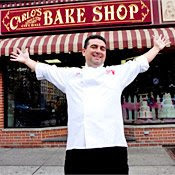 The show features, New Jersey's most sought after master baker, Buddy Valastro, who owns Carlo's Bake Shop in Hoboken, New Jersey. The show focuses on the incredible talent of Buddy Valastro and his team, who create the most amazing extravagant cakes, which could be considered works of art. This show is a must see because of the fact that Buddy Valastro, an Italian American, allows the world to see how the dynamics of an Italian American family live and work together. The family element is sincere and its incredibly touching to watch Valastro talk about his love and respect for his deceased father and how he's carrying on the family business. I am a former resident of Hoboken and know this shop very well and can say everything that comes from there is amazing. I wish Buddy Valastro and his family tons of success for this new show this summer. Click on the link below for the summer TV schedule on TLC.